Every time I get an invite to a fabulous New York sample sale, I'm tempted to hop on on the next flight and just go. After all, I'll be saving tons of money by shopping the sale which means the trip practically pays for itself. Please ignore my flawed reasoning and let me live in my fool's shopping paradise. 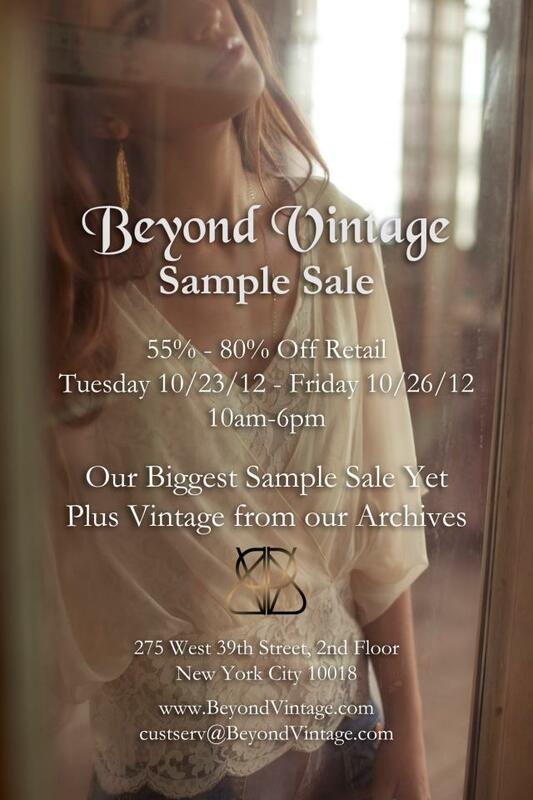 If you're in the Big Apple, please stop by the Beyond Vintage Sample Sale taking place from Tuesday October 23-Friday October 26 at 275 West 39th Street, 2nd Floor. It's their biggest sample sale yet as current and past seasons will be heavily discounted along with a selection of vintage from their archives. Indulge me and let me live vicariously through your Manhattanite shopping adventure. At the sale I would snap up these fall favs in a heartbeat. Actually, it's a good thing I won't be there because I can get downright feline at sample sales...claws out, pounce ready. Just discovered your blog, and love it loads. Keep up the fabulous work you are doing here.